What is Amaryl (Glimepiride) used for? Amaryl (Glimepiride) is an oral sulphonylurea medication prescribed to patients who are suffering from type 2 diabetes. It operates by stimulating the pancreas to increase the release of insulin helping to control elevated blood sugar levels. This is commonly prescribed along with a balanced diet and exercise to reduce the occurrence of symptoms such as fatigue, blurry vision, or confusion caused by hyperglycemia. Your doctor may also prescribe this medicine to be used along with others or to treat conditions not listed here. How should I use Amaryl (Glimepiride)? Follow your doctor`s instructions for using Amaryl (Glimepiride) to get the safest and most effective results. It is normally prescribed as one daily dose to be taken with breakfast, but your individual treatment will be determined by your current health condition, symptom severity, and response to other treatments. Do not alter any part of your prescription or self-medicate as misuse may lead to unexpected health problems. Swallow your daily doses whole along with a full glass of water and a meal. It is commonly taken after eating breakfast to prevent an upset stomach from occurring. Do not change the form of the tablets prior to use by crushing, chewing, splitting, or dissolving their contents in water as this may change their effects or destroy them. It is also suggested to take the doses at the same time each day to get the most efficient results by keeping a consistent level of medication in the system. Your doctor will want to monitor your progress by having you attend regular consultations while undergoing treatment. These will allow your response to medication to be observed and the correct adjustments made to your regimen. This may include altering your dosage or frequency of application until the best results occur. Ask your doctor or pharmacist if you have questions about the medicine to ensure the correct usage. What are the side effects of Amaryl (Glimepiride)? Amaryl (Glimepiride) may cause side effects in some users. These will not occur in all patients and can vary greatly in severity, but should be reported to your doctor as soon as they are experienced. Be especially cautious about any symptoms that are intense, persistent, or worry you. It may be necessary to reduce your dosage or application frequency to prevent further complications. In more serious cases, emergency medical attention may also be required. 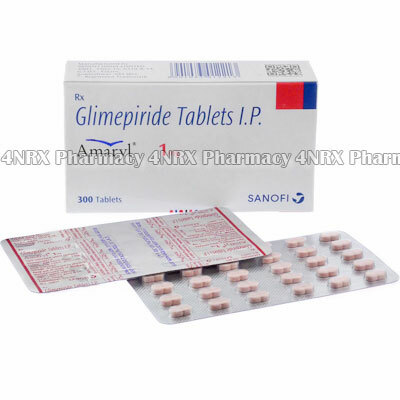 Amaryl (Glimepiride) should not be used by patients who are young children, pregnant, breastfeeding, lactose intolerant, allergic to sulphonamide medications, in a diabetic coma, or have type 1 diabetes, porphyrias, or severely decreased liver or kidney function. Also inform your doctor about other conditions that may cause complications with treatment such as if the patient is elderly or has an underactive thyroid, underactive adrenal glands, a G6PD deficiency, or decreased kidney or liver function. These may require reduced doses or other adjustments to the treatment to prevent potential side effects from occurring. Strictly use this medication as prescribed and follow all instructions provided by your doctor. Safe, suitable, and optimum dosage can vary and is dependent on the patient`s health and medical history, as well as the condition you are treating. Amaryl (Glimepiride) may not be safe or suitable for all patients. Always ensure your doctor is informed if you are pregnant or breastfeeding, using any other type of medication (including non-prescription medicine, vitamins, and supplements), as well as if you have any allergies, other illnesses, or pre-existing medication conditions.